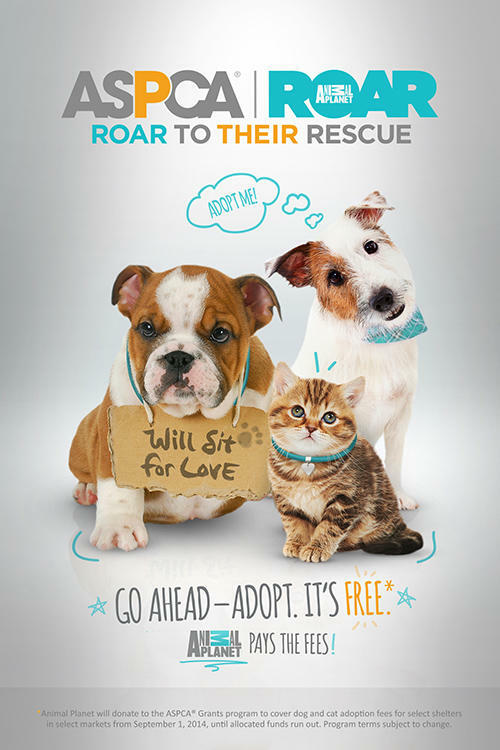 ROAR To Their Rescue: Animal Planet will donate to the ASPCA® Grants Program to cover dog and cat adoption fees for select shelters in select markets from Sept. 1, 2014 until allocated funds run out. Program terms subject to change. September is the perfect time to spread the love and adopt a new furry best friend. And to make it easier than ever, the Austin Animal Center, Austin Humane Society, Cleveland Animal Protective League and Miami-Dade County Animal Services Department are teaming up with Animal Planet in collaboration with the ASPCA® (The American Society for the Prevention of Cruelty to Animals®) to waive all adoption fees for dogs and cats starting Monday, September 1. The all-new “R.O.A.R. To Their Rescue” program will provide grants to these participating animal welfare organizations in Cleveland, Ohio; Austin, Texas, and Miami, Fla., to cover the cost of adoption fees. The “R.O.A.R. To Their Rescue” program will run indefinitely starting September 1 until each market reaches a $25,000 cap in fee waived adoptions. If you do not live near one of the participating shelters, you can still COME TO THEIR RESCUE by clicking here to become a Rescuer today.